1. 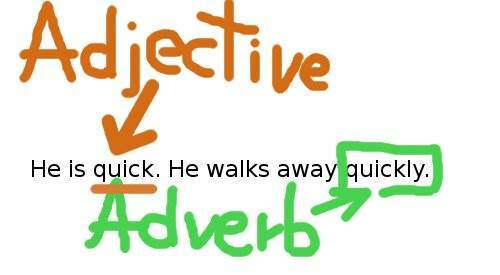 Complete the sentences with the adverb form of the adjectives. a) Your sister sings ______________ (beautiful). b) Why do you play your music ______________ (loud)? c) Please work _____________ (quiet). d) We're late! You need to walk _______________ (quick). e) Play this part of the music ______________ (slow). f) That's amazing. You play the guitar really ________________ (good). g) He speaks really ______________(fast). h) Jane and Steve are _______________ married (happy). i) I play tennis really _____________ (bad). j) The party will end really ____________ (late). k) My mother and father work really _______________ (hard). l) I left work _____________ (early). 2. Choose the correct words. a) I play the guitar very bad/badly. b) Her hair is beautiful/beautifully. c) I can't hear you. Speak loud/loudly, please. d) Close the door quiet/quietly. Natasha is sleeping. e) Your dog runs quick/quickly. f) Let's take the train. The bus is very slow/slowly at this time. g) I'm happy/happily today. I passed my tests! h) That music is very loud/loudly! i) You dance really good/well. j) Our children play happy/happily in the garden. k) She's a quiet/quietly girl. l) Eat your food slow/slowly. There's no hurry. a) I can swim very fastly. b) You played that song beautifuly. c) I want to leave work earlily. d) Walk quietily. There's an exam next door. e) I speak English very goodly. f) Do you work happyly? 4. Complete these sentences so that they are true for you. d) I speak English ______________________. e) I ______________ well but I ______________ badly. a) Your sister sings beautifully. b) Why do you play your music loudly? d) We're late! You need to walk quickly. e) Play this part of the music slowly. f) That's amazing. You play the guitar really well. g) He speaks really fast. h) Jane and Steve are happily married. i) I play tennis really badly. j) The party will end really late. k) My mother and father work really hard. l) I left work early. a) I can swim very fast. b) You played that song beautifully. c) I want to leave work early. d) Walk quietly. There's an exam next door. e) I speak English very well. f) Do you work happily?